​​Other Premium Service Member Pages on the links below. ​​We did close above the 2022.5 level on August 26, triggering the Bull Case. ​SP500 Index: Dead Cat Bounce or... ? ​We are at crossroads for the SP500 here. We reached and closed on August 27 the first gap at the 1965 zone. Also quite interesting to note that the EEM ETF ( iShares Emerging Markets ) is near back testing the Major Rising Wedge Pattern Trendline that started back in May 2009 also corresponding to the 50% Fibonacci level at 34.33. ​​​​​​​​​​​​​​​​​​​Only a daily close above 1922.5 ( it did on August 26 ) will give us another possible Bullish Impulse to ​1951 MAX 1961.5. New targets are 1965 MAX 2003. ​​​​​​​​​​​​​​​​​​​​​​​Seasonals are turning into a Grind Trade Pattern trend til August 29. ​​Then today I expect a range from 1951 to 2003. ​​​​​​​​​​​​​​​​1) On August 27, We reached and closed the first gap at the 1965 zone. 20 Years : ​ SP500 Seasonality Trend : Corrective Market ? ​​2) A Bleak Outlook: ​SP500, US Dollar and Foreign Profits : A Concern ? 3) August Seasonals: SP500 Index Seasonalities - Cloudy August ? 4) Fearless Market: SP500 Financials and VIX: No Fear into that Market ? 5) Lower Optimism: NASDAQ100 Index Bull% Index: Optimism Falling ? 6) EM Turmoil: Emerging Markets: 50% Fibonacci at Play ? 7) ETFs Volume: ETF s Volume Adv/Decl: Cratering ​? ​​8) Extreme Fear: VIX and SP500: From a Fearless Market to Pricing Panic ​? 9) Dow Theory: DJ Transport and Industrials: Another Warning from the Dow Theory ? ​10) Technical Rebound: SP500 Index: Dead Cat Bounce or... ? ​​​​Back to the technical levels now. ​We are in a Bull Trade mode ( since August 26 ) as long as we stay above 1951 on a daily close. ​​We broke on August 17 a downtrend channel that started on July 29 with 2065 as suport and 2095 as resistance. ​​​​​​​​​​​​We need to stay above 1951 for that Bull scenario to unfold. Those levels will make all the difference IF broken or not. A test and breaking up that level will cancel the Bear mode. Seasonals are turning into a Grind Trade Pattern trend til August 29. See links above. ​​​​​​The market should trade today between ​​1951 and 2003. ​Expect above average volatility in the weeks ahead. August 28 Any Follow Through ? August 27 Dead Cat Bounce ? ​​​​​​​​​​​​​​​Only a daily close above 1922.5 ( it did on August 26 ) will give us another possible Bullish Impulse to ​1951 MAX 1961.5. New targets are 1965 MAX 2003. ​​Then today I expect a range from 1934 to 1973. ​We are in a Bull Trade mode ( since August 26 ) as long as we stay above 1901 on a daily close. ​​​​​​​​​​​​We need to stay above 1901 for that Bull scenario to unfold. Those levels will make all the difference IF broken or not. A test and breaking up that level will cancel the Bear mode. ​​​​​​The market should trade today between ​​1934 and 1973. ​​August 26 Volatility Still ? ​​​​​​​​​​​​We did close below the 2088 level on August 19, triggering the Bear Case. We had yesterday the expected Dead Cat Bounce and near test the 1951 resistance zone and failed. DJ Transport and Industrials: Another Warning from the Dow Theory ? ​​​​​The Monthly close will be crucial here as we are geeting into Breakdown Territory on most Major World Stock Indices: ​​SP500 Macro Tecnicals: From Break Out to Breakdown ? ​​​​​​​​Only a daily close below 2088 (it did on August 19) will give us another Bearish Impulse to ​2046.5 MAX 2038 for now... New Targets of 1871.5 and 1860. ​​​​Only a daily close above 1922.5 will give us another possible Bullish Impulse to ​1951 MAX 1961.5. ​​Then today I expect a range from 1850 to 1925. Interesting to observe that the top performers ( Like the Heathcare Sector (XLY) and Internet Stocks (FDN ETF) and Biotech Stocks (IBB ETF) have been beaten violently. ​​That tells me liquidation to cover losses on bad stocks positions. ​VIX and SP500: From a Fearless Market to Pricing Panic ​? ​ETF s Volume Adv/Decl: Cratering ​? 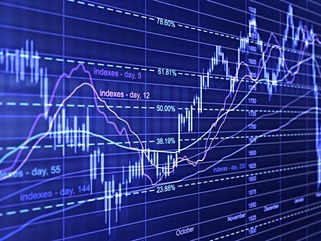 ​Emerging Markets: 50% Fibonacci at Play ? ​​Take note that on a Macro basis, we have Lower Bullish Sentiment overall and that bring tha Trendless Range Trading we have since the past few months: ​​​​NASDAQ100 Index Bull% Index: Optimism Falling ? 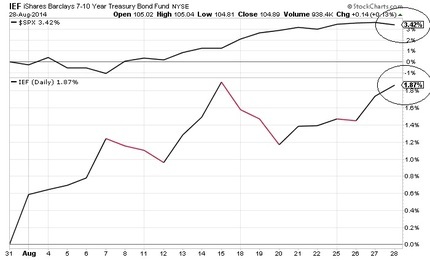 ​SP500 Financials and VIX: No Fear into that Market ? ​We are in a Bear Trade mode ( since August 19 ) as long as we stay below 1922.5 on a daily close. ​​​​​​​​​​​​We need to stay below 1922.5 for that Bear scenario to unfold. Those levels will make all the difference IF broken or not. A test and breaking up that level will cancel the Bear mode. ​​​​​​The market should trade today between ​​1850 and 1925. August 25 Liquidity Capitulation ? ​​Emerging Stocks Markets and Currencies were already in Turmoil and the SP500 Index was in fact in a very complacent mood. The Strong US Dollar is typical of bringing Financial Volatility as previous Major Correction was almost always preceded by a strong US$. ​​The Monthly close will be crucial here as we are geeting into Breakdown Territory on most Major World Stock Indices: ​​SP500 Macro Tecnicals: From Break Out to Breakdown ? ​​​​​​​​Only a daily close below 2088 (it did on August 19) will give us another Bearish Impulse to ​2046.5 MAX 2038 for now... New Targets of 1911 amd 1890. ​​​​Only a daily close above 1951 will give us another Bullish Impulse to ​1961.5 MAX 1973.5. ​​Then today I expect a range from 1872 to 1973. ​We are in a Bear Trade mode ( since August 19 ) as long as we stay below 1951 on a daily close. ​​​​​​​​​​​​We need to stay below 1951 for that Bear scenario to unfold. Those levels will make all the difference IF broken or not. A test and breaking up that level will cancel the Bear mode. Seasonals are turning into a Grind Trade Pattern trend til August 24. See links above. ​​​​​​The market should trade today between ​​1872 and 1973​. ​​August 24 The Perfect Storm ? ​Bulls: a ​Support Trendline then at 2038. I will start to focus on a Support Trendline at 2001.5 that started back on December 16 2014. The Monthly close will be crucial here as we are geeting into Breakdown Territory on most Major World Stock Indices: ​​SP500 Macro Tecnicals: From Break Out to Breakdown ? ​​​​Only a daily close above 1973.5 will give us another Bullish Impulse to ​1985 MAX 2002.5. ​​​​​​​​​​​​​​​​​​​​​​​Seasonals are turning into a Grind Trade Pattern trend til August 24. ​​Then today I expect a range from 1890 to 1965. ​We are in a Bear Trade mode ( since August 19 ) as long as we stay below 1973.5 on a daily close. ​​​​​​​​​​​​We need to stay below 1973.5 for that Bear scenario to unfold. Those levels will make all the difference IF broken or not. A test and breaking up that level will cancel the Bear mode. ​​​​​​The market should trade today between ​​1890 and 1965. ​​​August 21 200 DMA Broken ? ​We did broke the 200 DMA ( Day Moving Average ) on August 20 then at 2063.7. Also, we did broke the Last Line of Defense for Bulls: a ​Support Trendline then at 2038. ​​​​Only a daily close below 2088 (it did on August 19) will give us another Bearish Impulse to ​2046.5 MAX 2038 for now... New Targets of 2001.5 amd 1992. ​​​​Only a daily close above 2046.5 will give us another Bullish Impulse to ​2056.5 MAX 2064. ​​Then today I expect a range from 2001 to 2038. ​We are in a Bear Trade mode ( since August 19 ) as long as we stay below 2046.5 on a daily close. We are within a new uptrend channel that started on August 12 with 2067.5 as suport and 2106.5 as resistance. ​​​​​​​​​​​​We need to stay below 2046.5 for that Bear scenario to unfold. Those levels will make all the difference IF broken or not. A test and breaking up that level will cancel the Bear mode. ​​​​​​​​​​​​​​​​​​​​​​​​​​​​​​​​​​​​​​​​​​​​​Adding the 2000 DMA at 2064 is clearly indicating the levels not to break for bears. ​​​​​​The market should trade today between ​​2001 and 2038. August 20 Broken Wedge ? ​​​​​​​I will focus on a wedge this week that can trigger the next move. : 2079.5 support and 2106.5 as resistance. See 2 nd chart below - bottom blue trendline for support and top red trendline as resistance. Not Only on August 19 ( with the still Dovish FOMC ) we tested the 20 and 50 DMA and failed to stay over. It was a huge market rejection. Alos on August 19, we broke the Support Trendline from the wedge at then at 2079.5. Last Line of Defense for Bulls ( exclding the 200 DMA ) is a Support Trendline at 2038. ​​​​Only a daily close above 2070.5 will give us another Bullish Impulse to ​2081 MAX 2089. ​​​​​​​​​​​​​​​​​​​​​​​Seasonals are turning into a Corrective Trade Pattern trend til August 20. ​​Then today I expect a range from 2046 to 2078. ​We are in a Bear Trade mode ( since August 19 ) as long as we stay below 2070.5 on a daily close. ​​​​​​​​​​​​We need to stay below 2070.5 for that Bear scenario to unfold. Those levels will make all the difference IF broken or not. A test and breaking up that level will cancel the Bear mode. ​​​​​​​​​​​​​​​​​​​​​​​​​​​​​​​​​​​​​​​​​​​​​Adding the 50 DMA at 2088.5 is clearly indicating the levels not to break for bears. Seasonals are turning into a Corrective Trade Pattern trend til August 20. See links above. ​​​​​​The market should trade today between ​​2046 and 2078. August 19 No Momentum ? ​​​​​​​​​​​​We did close above the 2083.5 level on August 12, triggering the Bull Case. ​Currencies - see CEW ETF as proxy. ​​Only a daily close above 2083.5 (it did on August 12) will give us another Bullish Impulse to ​2097.5 MAX 2099. ​​​​​​​​​​​​​Seasonals are turning into a Corrective Trade Pattern trend til August 20. ​​Then today I expect a range from 2080 to 2098. ​We are in a Bull Trade mode ( since August 12 ) as long as we stay above 2088 on a daily close. ​​​​​​​​​​​​We need to stay above 2088 for that Bull scenario to unfold. Those levels will make all the difference IF broken or not. A test and breaking up that level will cancel the Bear mode. ​​​​​​The market should trade today between ​​2080 and 2098. August 18 Above the 50 DMA ? ​almost reached in the overnight trading session with 2094.5 ). In fact, the real concern to me is that it bring turmoil in Emerging Foreign Currencies - see CEW ETF as proxy. ​​​​​I will focus on a wedge this week that can trigger the next move. : 2078 support and 2106.5 as resistance. See 2 nd chart below - bottom blue trendline for support and top red trendline as resistance. ​​Then today I expect a range from 2085 to 2104. Take note that on a Macro basis, we have Lower Bullish Sentiment overall and that bring tha Trendless Range Trading we have since the past few months: ​​​​NASDAQ100 Index Bull% Index: Optimism Falling ? ​​​​​​​​​​​​​​​​​​​​​​​​​​​​​​​​​​​​​​​​​​​​​Adding the 50 DMA at 2088 is clearly indicating the levels not to break for bears. ​​​​​​The market should trade today between ​​2085 and 2104. ​​​​August 17 Still into the Channel ? ​​We did close above the 2083.5 level on August 12, triggering the Bull Case. ​and both were rejected and we failed to close above the 50 DMA; That tell me that we had what I thought, ONLY a dead cat bounce and we re still within that downtrend channel with 2066.5 support and 2066.5 as resistance..
​​We are still into that downward channel that started back on July 29 with 2065 as support and 2095 as resistance ( that was almost reached in the overnight trading session with 2094.5 ). ​​I will focus on a wedge this week that can trigger the next move. : 2076.5 support and 2106.5 as resistance. See 2 nd chart below - bottom blue trenldine for support and top red trendline as resistance. ​​Then today I expect a range from 2080 to 2095. ​We are in a Bull Trade mode ( since August 12 ) as long as we stay above 2084.5 on a daily close. We are within a downtrend channel that started on July 29 with 2065 as suport and 2095 as resistance. ​​​​​​​​​​​​We need to stay above 2075 for that Bull scenario to unfold. Those levels will make all the difference IF broken or not. A test and breaking up that level will cancel the Bear mode. ​​​​​​The market should trade today between ​​2080 and 2095.